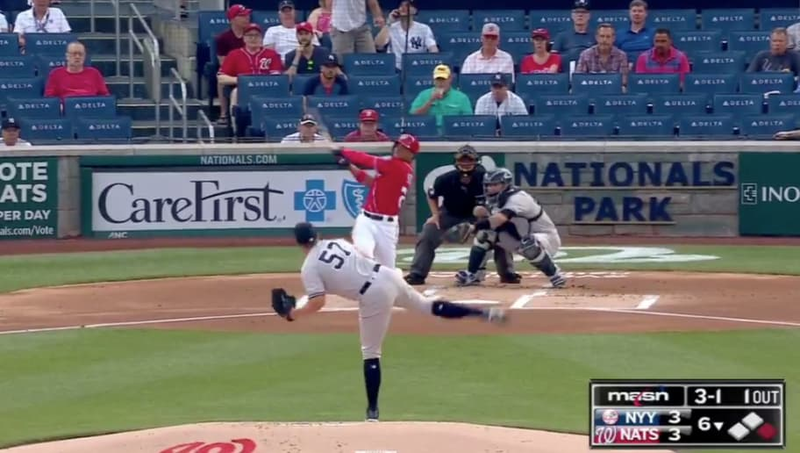 ​​Juan Soto kills the Yankees so hard that he's now biding his time by drilling massive homers in games that technically took place five days before he joined the Nationals. Go figure. And while you're figuring, watch this one fly. Juan Soto made his MLB debut on May 20. He just hit a 💣 in a game that started May 15. ​​Yes, Soto wasn't ​promoted to the Show until after the rainstorm that flooded our Nation's Capital was done washing out the Yanks-Nats series in mid-May, but that didn't prevent him from raining down blows on the Yankees now that the game's been resumed. Fresh off two dingers in the Bronx last week, Soto supplemented that flurry with one that "preceded" 'em. ​​You can try to wrap your mind around this puzzler, or you can just watch the dinger fly and ignore all the laws of space-time. Your call. ​​Who cares about the logistics? Whether this shot took place in the '70s or the modern era, it went a country mile and this kid is literally 19 years old. Numbers are meaningless these days.